Don’t believe us? According to a report by The Intersect Group, 60 percent of the cost of finance is tracked to labor such as manual data entry. Consider how long data entry takes for your business now, and how much it would be worth if your organization removed that step. So, how can you remove this low-value activity and replace it with technology that will give your business a much higher ROI? With automated data entry solutions such as Optical Character Recognition (OCR) software, your business can eliminate the need for human intervention, allowing more time for more valuable processes. Technology has created new methods by which system processes are made easier and faster through automation – one of which is OCR software. By definition, OCR data entry is the process in which data is extracted from scanned or digital documents, reformatted, and transformed into searchable and editable text. 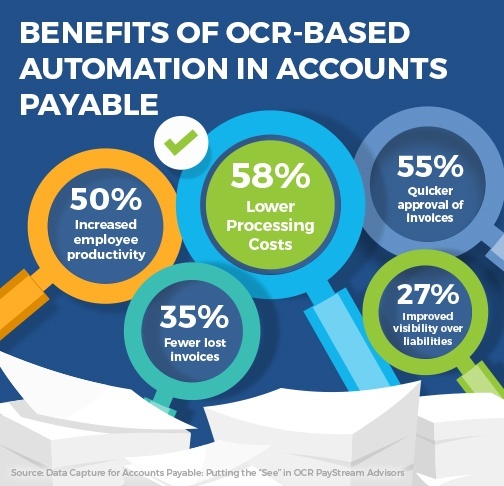 Many Accounts Payable departments implement automated OCR into their business processes to initiate workflows. For example, an Accounts Payable clerk receives an invoice via snail mail and scans it into their automated system. Upon doing so, the OCR data entry technology detects and identifies characters (vendor name, line-item details, etc.) and converts that information into text. The system then matches the characters to a stored library, making all related information easily accessible and available to those with permissions. In short, instead of having someone read a value on a page, type it in, and then repeat infinitely, we let the OCR software detect and translate the value for you. As your organization grows, documents quickly pile up for departments reliant on manual data entry or manual document sorting, causing dissatisfied customers, delayed invoices and inefficient communication. In addition, manual processes are notoriously error-prone, grinding workflows to a halt while discrepancies are resolved. Ensuring that all data entered into your business is accurate, relevant, up-to-date and easy to decipher is critical to running a successful business, so corporations that deal with volumes of paper files and records need to have a streamlined flow of documents. Still, a whopping 51% of financial executives are still painfully dealing with manual data entry, according to a report by Financial Force. In fact, these executives report this task as the biggest challenge in their accounting system. In most organizations, once a document comes in, there’s a gap period between when something exists in the universe of that business and when something can actually be done with it. Automated data entry allows your organization to capture the data up front, making it immediately actionable, and replacing slow, costly manual data collection with fast, automated data entry software. By using OCR software, documents no longer need to be manually indexed, which leads to increased productivity, an improved bottom line, and better overall results. This lean, efficient workflow can slash data entry time and costs by up to 90%, according to a report by Binary Office. The software’s technologies, automatic document classification, and highly customizable architecture helps large and small businesses increase efficiency and reduce costs. With these powerful features, business will further eliminate time-wasting manual paper processes and replace them with improved document sharing and collaboration across departments. Businesses have documents coming into their organization from many different directions, and most fail to successfully and effectively capture it all. The use of OCR software places an increased emphasis on processing paperwork automatically across departments, which further reduces costs and accelerates business workflows. To learn more about DocuPhase’s OCR capabilities and how they will benefit your organization, schedule a test drive.